Bake for Happy Kids: Homemade Tuna Fish Floss - Surprise! Surprise! It is really easy to make! 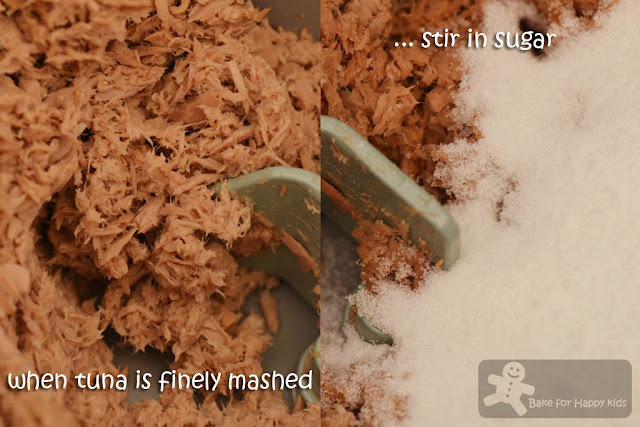 Homemade Tuna Fish Floss - Surprise! Surprise! It is really easy to make! Every weekday at about 6pm, my husband arrives home from work and the first thing he always asks is "What's for dinner?". As usual, I don't bother replying him as I'm like "See it yourself!" LOL! "Did you make these meat floss?" asked my husband with impressed look. Yup! Since my husband looked impressed with my cooking, I thought I better response... LOL! My son heard the commotion and came to our dinning table to make more noise. Feeling excited, they grabbed the spoons on our dinning table and each took a big mouthful of the floss. "Hey... Don't touch the fish floss! They need to be dry!" I exclaimed and walked forward to smack two itchy hands! "Ok... but is dinner ready?" After tasting the floss, my husband and son said that they are very hungry for dinner and I guess it's an indication saying that floss is nice! Fish floss? For those who don't know fish floss, you would think fish floss is gross! Am I right? LOL! ... but for those who know and tasted fish floss, I'm sure that you wouldn't mind eating it and wouldn't say that it is gross! Right? 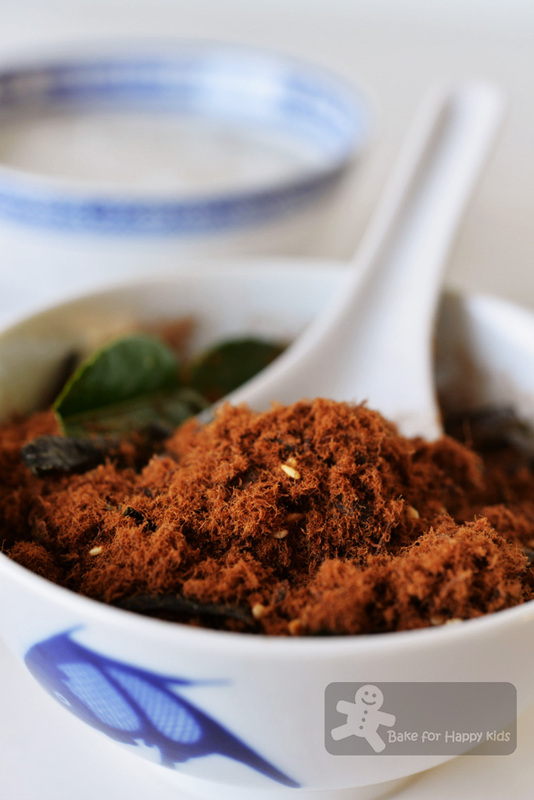 According to Wikipedia, fish floss together with pork floss and chicken floss are commonly known as Rousong or 肉松 in Chinese in Asia which are dried meat products with light, cottony, fluffy and slight crispy texture. 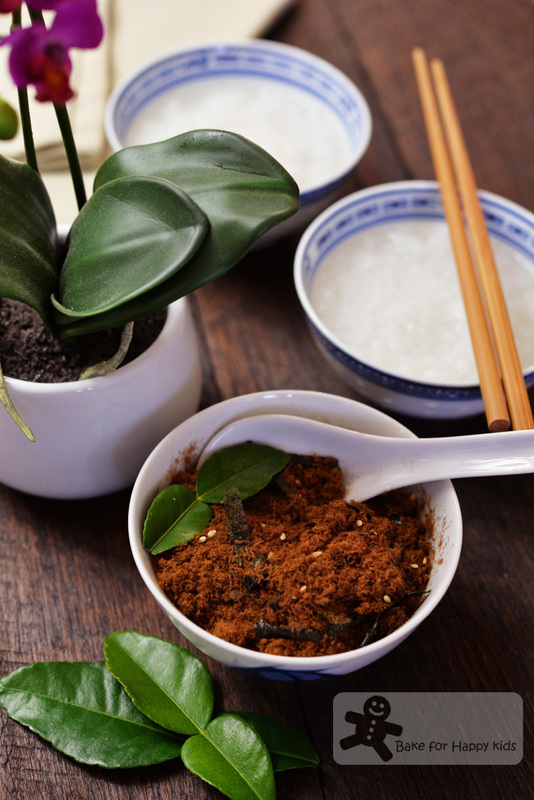 Rousong is usually consumed either as a topping for foods like congee and tofu or filling for buns and pastries and can be as delicious and appetizing as on its own. Yum! Now... you see why we love eating fish floss. "I made these with two large cans of tuna." I proudly replied. "Oh!" My husband was impressed. "You know what... We can forget about buying fish floss from Singapore because you can make them!" "Yeah, mummy! Yours fish floss is nice!" Faint... "Guys, I'm happy to make more fish floss but making lots of these can take me a lot of time!" Errr... To be honest with you, I wasn't totally honest with this time-consuming-fish-floss-making remark. LOL! I don't mind making these fish floss but don't wish to have any long term commitment of making fish floss every now and then. To be honest with you, making these tuna fish floss is really really really easy as all I have to do is cook and stir! It is even easier if you use a breadmaker with jam setting (like how Ms B from Everybody Eats Well in Flanders make her own chicken floss) because the breadmaker will do the cooking and stirring for you. While the breadmaker is making the fish floss for you, you can either stand in front of the breadmaker to watch it cooking and stirring for 3 hours... LOL! or walk away to do other chores. Well, do you think making your own fish floss is really easy? If you don't have a breadmaker to make your own fish floss, I suggest that you should reduce the amount that I made by half so that you don't have stand in front of your hot stove to cook and stir for too long. You know... Lesser floss means less cooking time. It is important to choose the canned fish in Spring water. Not oil and not brine! You can use other types of canned fish if you like. 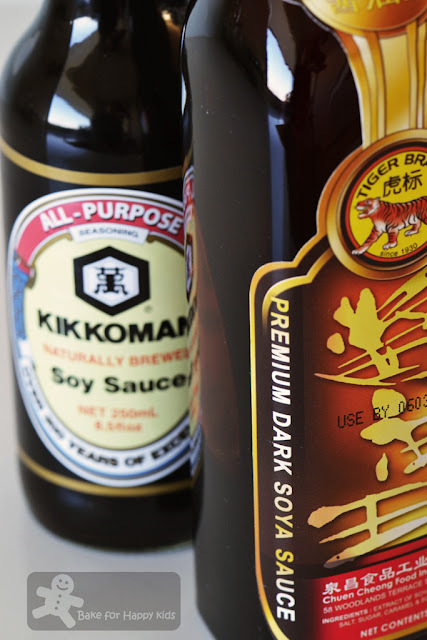 ... with these soy sauces and caster sugar! 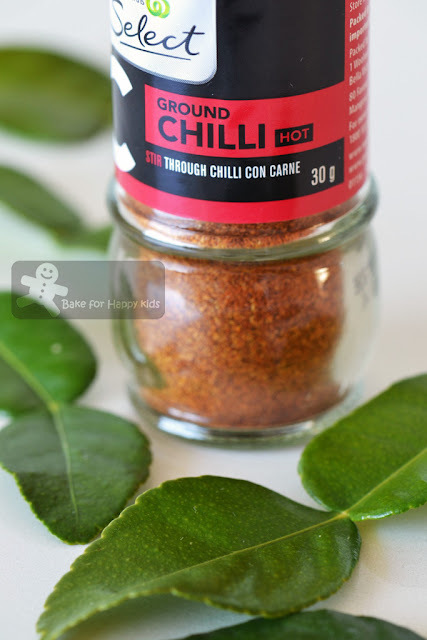 The addition of ground chilli powder and kaffir lime are additional but they will help to reduce the fishy taste in your floss and enhance its taste if you are a chilli and lime food lover. This is what I did for the first 10 mins of cooking and stirring. Then, I left the breadmaker to do these for the next 3 hours. For a nice nutty taste, you can add roasted sesame seeds into your floss. To serve, I have mixed in shredded nori to the floss and I did this just before serving. "Yeah, mummy! Your fish floss is nice!" 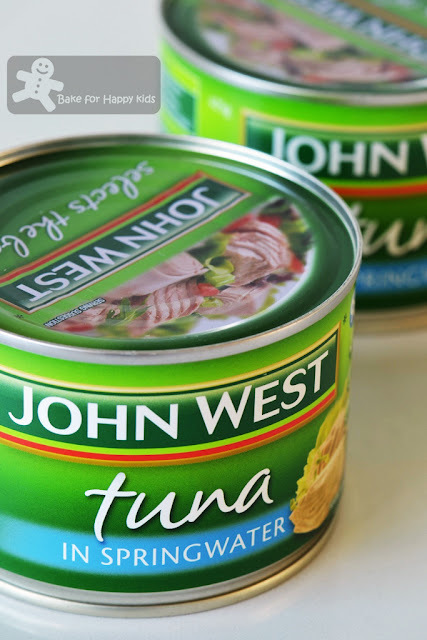 2 x 425g canned tuna, must be in Spring water, NOT in oil or brine! Drain tuna very thoroughly first. If you are using a breadmaker, place drained tuna into the loaf pan that is placed in a breadmaker. Use "jam setting" to cook and mix tuna in the breadmaker. If you don't have a breadmaker, you can use a large cooking pan with large area to cook your fish floss. To reduce the time spent on cooking and stirring, you might wish to use half the amount of this recipe for your cooking. Place the cooking pan over low heat. Place drained tuna in pan and use a spatula to mash and stir the tuna while cooking. 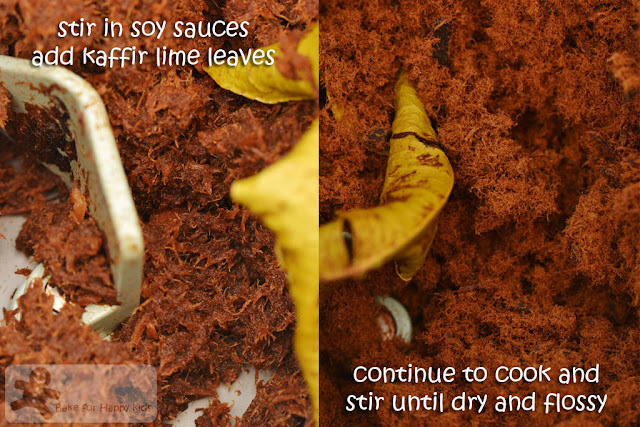 When the tuna is finely mashed, add both soya sauces, sugar, kaffir lime leaves and chili powder. Continue to cook and stir over low heat until mixture is dry, flossy and golden brown. With this amount of tuna that I have used, I need to cook the floss with 3 cycles of jam setting. Each takes about 15 mins of warming up and 50 mins of cooking and stirring which adds up to be about 3 hrs of cooking and stirring in total. Depending on the humidity of your kitchen, you might need to use slightly more or less time to cook your floss. When the floss is done, remove from heat. At this stage, the floss is light, soft and fluffy because the tuna fish is not very fatty. To add a finishing crisp, you need to place spread a thin layer of the floss (about 2 cm or 1 inch thickness) on a baking tray lined with baking paper. Spray the floss with a thin layer of cooking oil spray and bake the floss in a preheated oven at 130°C with or without fan forced (fan forced is better!) for 5 mins. Repeat the same baking step with the rest of the floss. After baking, allow floss to cool to room temperature. When the floss is cooled completely, the floss will be crispy. 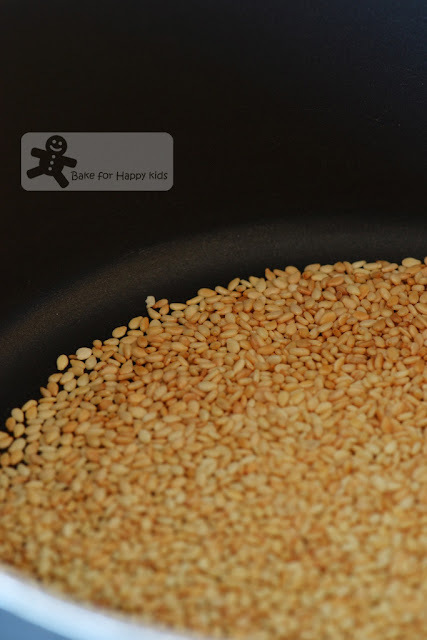 Stir in roasted white sesame seeds. Add finely cut non-seasoned nori strips according to the amount that you like just before serving and serve. I prefer not to store fish floss with the nori strips as I notice that the nori tends to absorb moisture from the floss sometimes. As there is no preservative and less amount of sugar added, I prefer not to store fish floss in room temperature. For me, I stored my fish floss in an airtight container in the fridge up to 2 weeks or in airtight container in the freezer up to 2 months. If the chilled floss loses its crispness, place a thin layer of the floss on a baking tray lined with baking paper, spray the floss with a thin layer of cooking oil spray and bake the floss in a preheated oven at 130°C fan forced for 5 mins and the floss will become crispy again. Wow, incredible! Thank you so much for sharing this great recipe Zoe. Looks super delicious! Zoe, I am not a fan of meat floss and have not tried fish floss before. But still, I am very impressed! wow looks yummy. thanks for sharing Zoe. 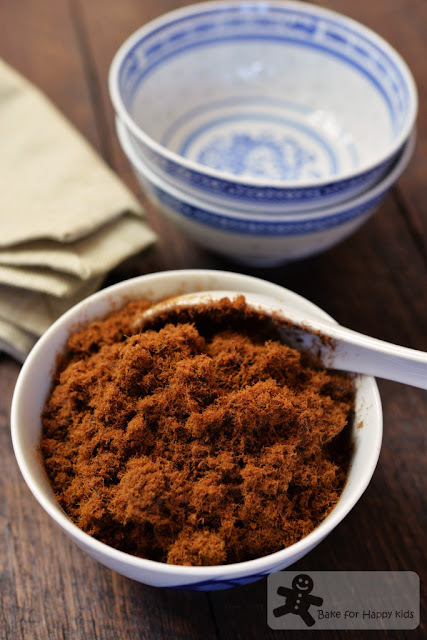 Can we make pork, chicken or prawn floss using your method? Sorry that I have not try using pork, chicken or prawn to make different floss yet and so can't commit to say that this recipe and method will work for other meat. Cheers! Hi, thanks for sharing. I have questions regarding the three cycles. Just want to clarify it means that after the first cycle is done, we continue the second cycle and then later the third one with all the ingredients inside, is it? And when do we add the sugar, soy sauce, etc? All during the first 15 minutes of stirring in first cycle? If not mixed properly, do we need to manually mix it or just leave it to be mixed on the second cycle? Thanks. I am so exciting to try this recipe. Thanks for answering. Thanks for clarifying. First cycle of jam is on progress now. Fingers crossed. I only use half recipe, because my tuna is smaller can, si i ended up using 3 cans to be equal to 245gr. If this succeed, it is going to be a keeper recipe, as the hardest thing is opening the cans. Hahaha. I have never used the jam segting in my BM. Sox i was quite surprised that it didn't move at all. Luckily you mentioned that it took about 15 minutes warming up (mine 20 mins though). Thanks for being so clear and precise. It looks a little bit wet now in the BM. wondering if i didn't drain the tuna well. Oh.. will keep you updated with the result. Thanks again for sharing. Wow, Zoe! Fantastic! 3 hours in the bread machine? I have an old model and it has no jam making function. Aiyoh...!!! I have tried meat floss never fish floss. Floss is new to me! Well, the edible kind, I mean, not the kind I use for my teeth. :-) This looks really neat -- such a fun dish. Thanks! Seriously, at the beginning of the post I too thought, what? Floss? But now I see what u mean. I am a great fan of canned tuna but only make stir fry with it. 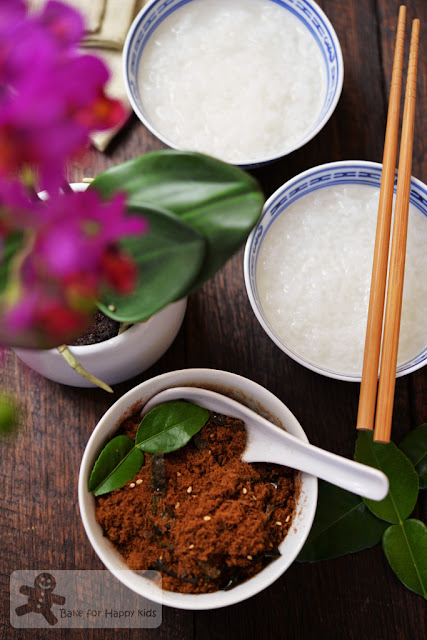 This sounds nice & interesting especially for my congee loving hus !